At Marshall & Stewart we offer a complimentary bed consultation service to help you discover the correct model and support system for you. Each 45-minute consultation involves a lifestyle evaluation and sleep analysis and is taken by an experienced member of the Marshall & Stewart team. Each person is affected by poor sleep at one time or another, but it is alarming how many people simply tolerate it, not acknowledging that disturbed sleep affects not only the third of their life that they're in bed, but also the two thirds when they are awake. Prolonged sleep deprivation, whether it is an inability to fall or stay asleep can cause back pain, premature ageing, stress, weight gain and mood swings. If you would like to know more about how a Marshall & Stewart bed can revolutionise your sleep experience, please call us on +44 (0)20 7723 2925. Find out how we're re-defining luxury at Marshall & Stewart. 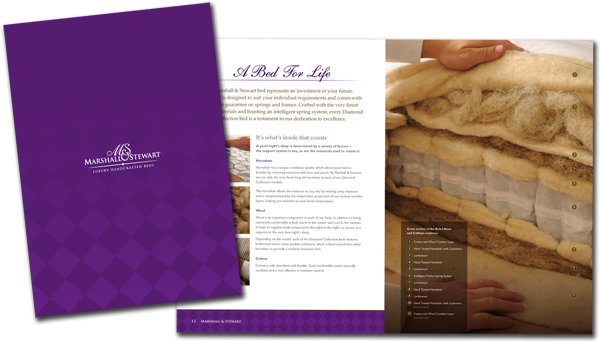 Take a step closer to experiencing luxurious, restorative sleep with our Diamond Collection brochure. Featuring all six of our exquisite, handcrafted beds you will discover how each of our bespoke models are created to suit the individual requirements of every Marshall & Stewart client.